The Scheiber panel on my 2009 SO 45DS displays and sounds a high voltage alarm every time I disconnect shore power and start the engine. Causing multiple panel resets until (speculating) the alternator controller lowers the input into the batteries. Is anyone else experiencing this issue and does anyone know how to disable the alarm (the admiral is very annoyed). The local dealer has told me that this is a common problem with the Scheiber/Jeanneau install and has no 'fix' for the source of the problem. I had a similar problem, mainly due to my Trojan batteries needing about 14.8V to get to 100% charge in a reasonable time. The alarm went off all the time around 14.7V and the unit would often lockup and need to be reset. I couldn't find any means of adjusting the alarm voltage or turning it off. The lockups over 14.7V meant it wouldn't have helped anyway. I think that the link below gives the manual but don't think it will help with your problem. My unit eventually died after a slight power surge. I wasn't keen to replace it with an identical unit but did want something that would appear very similar. I decided Arduino was the way to go and not too difficult to learn wrt code and circuit design. However, the project grew a little. 2) Available IO pins in short supply because the parallel display was using almost all of them. I considered using something with more IO pins or building a board to convert serial to parallel. The Ardiuno was so cheap that it was simpler and cheaper to use a second Arduino. One board handles the inputs from buttons and sensors whilst the second one runs the display side. The display Arduino acts as a slave and is controlled by a serial link from the other Arduino. 3) I wasn't happy with the fragility of the original Scheiber unit as it didn't like 15V and I think a spike killed it. I designed an IO board to handle all sensor inputs up to 100V and also the odd spike (hopefully). It also included transistor switches to power backlight, fuels sensor circuit etc. on and off. The board uses 2 four channel ADS1115 ADCs. I copied look of each page on Scheiber unit and also used the original control buttons. It all seems to work, looks like the original (though display not quite as good as the original). One big advantage is that I could calibrate tanks to give meaningful readings. Original only gave a VERY general indication of fuel and water levels. New unit actually gives meaningful readings. Plus more features if I feel the need to extend it (e.g. display readings from other kit). Interesting little project for my first look at an Arduino and I'll certainly consider using these to fix a few other items I've been meaning to replace (e.g. Boat alarm with SMS alert, doubles as anchor alarm). Perhaps something a bit simpler might have been better, but as I said "these things grow". Very neat solution to a problem. My unit is still working OK but now I know which way to go when it fails. That is a seriously impressive modification to your panel. Could you possibly write it up a little and include the source code for the H&T section of the site? That is just a brilliant way to get around a problem with the original panel that from my perspective is a little too hard to find real information on. Also, a great way to improve the accuracy of the tank level guages. I am guessing you multiply the tank reading by some variable coefficient depending upon the actual tank reading, evening out the inaccuracy caused by tank geometry. I'll try to find time to write it up, probably in winter as it's cooler and I should have more time. Water tank sensors are actually just wired to screws going through the tank. 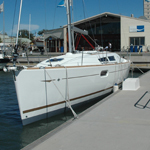 Jeanneau use a Scheiber box which outputs a fixed voltage when each screw is covered. All Jeanneau needed to do was use a template to let the guy know where to put the screws. Unfortunately, it seems that they were just put in random positions and one unit was even wired incorrectly. Nowhere near the 25%,50%,75% and 100% indicated by the standard unit. I could put in screws at the correct places to get these readings. However, having readings bunched up near the bottom end is actually more useful. At least I now know when a tank gets down to 30-40 litres instead of the original just showing 50% (i.e. 80-100 litres). The fuel gauge still isn't great as it seems to stick at 139 Ohms. I'll probably have a look at the sensor at the end of the season. <100 Reading in Ohms displayed as I'm still calibrating low readings. I should really generate a polynomial equation to follow the tanks contour but decided that wasn't worthwhile yet. The nice thing about DIY is that it is easy to alter the code to give any readings you need. I'm pretty certain that everyone's tanks will give different results. I suppose that I could eventually add a menu option to allow a matrix to be tweaked for each tank, with the results stored in non-volatile memory. That would avoid having to modify the code to alter the readings if a sensor was giving incorrect results. I did manage to source the switches (either loose or assembled in the correct layout). However, I was able to unsolder the originals and use them on a new board. 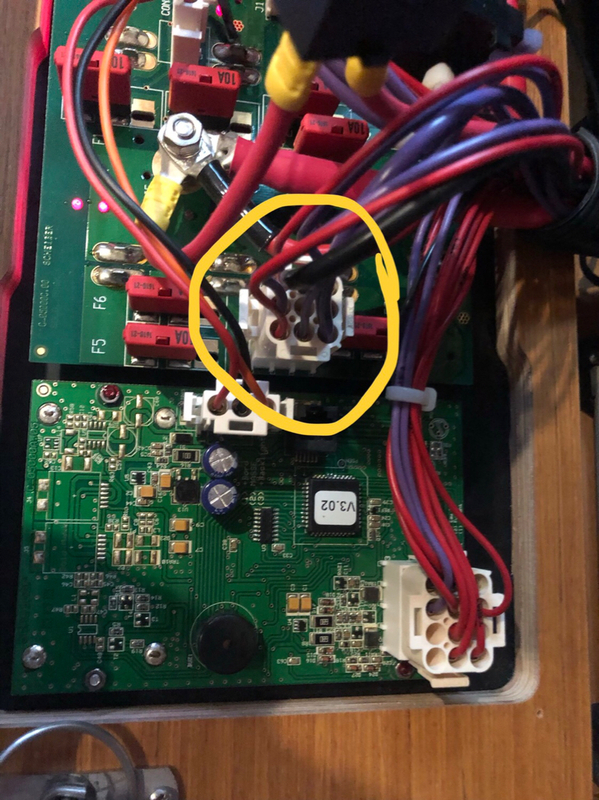 On my new '11 39i I was surprised to see that the panel does not indicate house battery amp draw, but when I look at the manual it looks like it is supposed to. 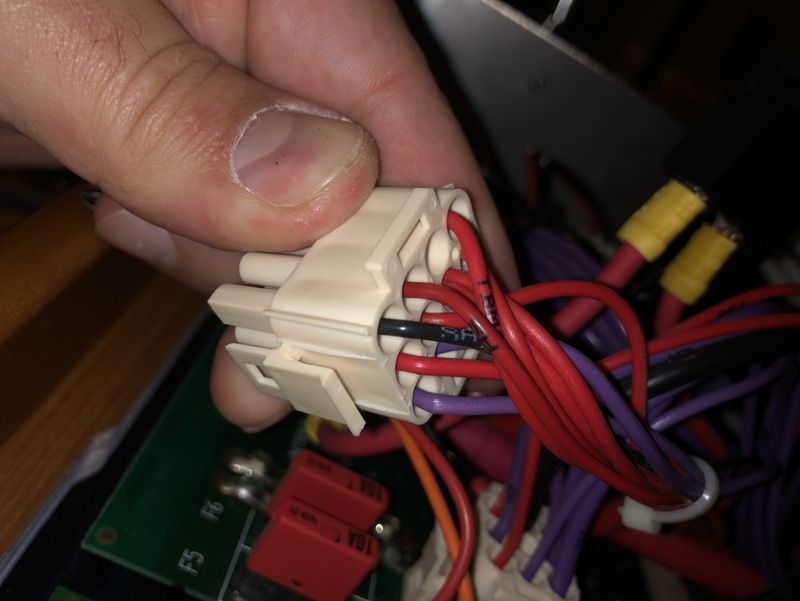 Is that an option that Jeanneau doesn't install, or is there a problem with the panel or wiring? I followed the the hints and tips instructions shown above to get the amps used to display and it worked perfectly. The display will only show whole amps and not the decimal amps that Mistroma was able to design. I don't know why it wasn't set up to display in 0.5A increments, I guess Scheiber reckoned nobody was interested. I found that I had to turn on a lot of LED lights to get a 1A reading instead of 0A. The DIY approach allowed me to chose 0.1A increments. However, that's really only useful for LEDs and getting a better idea of current draw from fridge. The original wiring gives poor Voltage readings due to voltage drop. Current readings also ignore lots of things such as central heating, windlass, winch, charging sources etc. You only get a rough idea of current used by fridge, lights, nav. lights and instruments. I fitted a cheapo eBay LCD unit (approx. £18) with a sensor slipped over a main battery wire. It's great and gives Ah,Wh,A, Voltage etc. and also has Bluetooth. I might add an extra option to my code to show "All" as well as "Domestic", "Engine" and "Bowthruster". I'd just need to add a Bluetooth module to one Arduino and could then plot total Amps In/Out in real time. I already get running totals via LCD display or phone app. Having all sorts of alarms all the time and also having the LCD readout fade away, I was close to getting a new LCD-Alarm panel at 800 euro´s or so. Then I found out that when you pulled the plug of the power feed from the LCD panel to the motherboard the thing would re/set it self. I bought a micro switch for 10 euro and wired it between the red wire of the power feed. little hole in the panel and now I have reset and off button. It will not cure the ever present aillments of the panel but at least you can shut it up and the LCD readout works fine again. Had this mod for 3 years now. What is this bluetooth sensor you picked up? It just slips over the battery wire? I didn't know you could use inductive coil current sensing for DC current...how does it work? I mentioned this item in another thread and gave an eBay link to the unit. I think you should find more detail via the last post in the link below, let me know if you need more information. You certainly have done some great analysis. Many thanks for sharing it as you have provided hard data for some of the anomolies we may suspect exist. Very kind of you to mention it. It would be trivial for Jeanneau to setup the water tanks to give meaningful readings. All that's required is to fill one tank in 25% increments and mark the levels on the side. Then they could make up a template based on that to use on every boat using that tank. A simple piece of wood with locating blocks and a hinged marked section hanging down the side would work. Obviously too much work and I think they just fit the sensor screws by rough guesswork, making the levels different for each boat they turn out. I think that the control box part no. is 50.BTE05000E.00 and I have a manual for this unit (See link below). It simply shows a different voltage as each sensor screw is covered with water. Actual voltages vary slightly but are always well within the stated range for each level. Very easy to detect each step as it happens but you are always stuck with odd positions Jeanneau decided to put screws through the tank. Water tanks were very easy to setup, fuel is trickier as it varies and sometimes seems to stick or jump up then fall back. I've looked at the sensor an it seems to respond as expected when moved manually. I think that the float might sit on one side of the support arm and wondered if that caused the arm to twist. That might explain why it sticks in use but moves freely manually. A new unit might fail fairly quickly because of this problem. I'm going to remove the sensor in a month or so to see if I can find a fault and buy a new unit if it is faulty. Currently opening everything possible and tracing wires to label them properly with something meaningful...the dymo label machine arrives tomorrow! While looking at the scheiber panel my wiring doesn’t make sense to the drawing. I also have a cable going in to fuel tank no 2, but I only have one fuel tank. 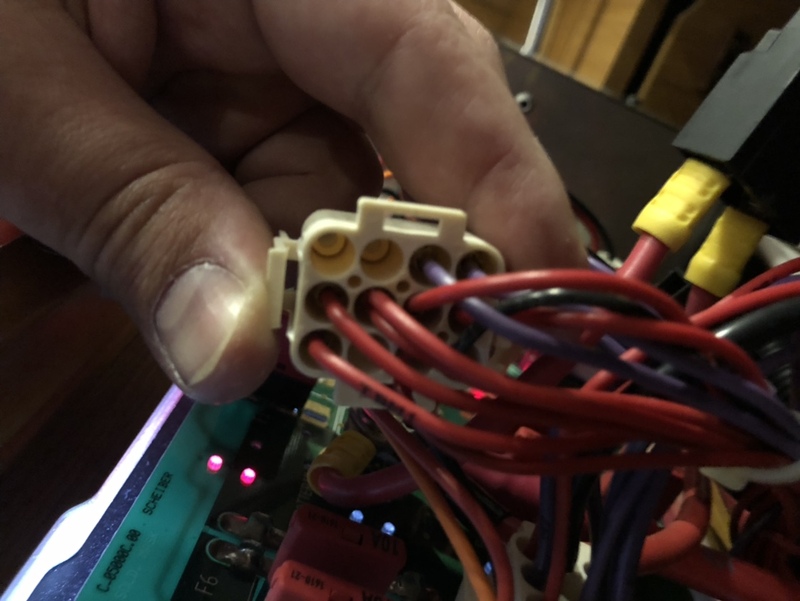 I’m changing all the sensors out for Maretron TLM-100 sensors to connect to the NMEA so it’s not mega important....but I like to know how and why when it comes to the kit onboard. As I have a mastervolt BTMIII monitoring the domestic and engine batteries I may just unplug all the connections with the exception of the auxiliary (bow thruster) battery as it isn’t on my MV BTMIII. The connector and schematic do match up and look the same as mine on 42DS. The 2 empty holes in your first picture are unused for tanks 3 and 4 (not normally fitted). The 2 adjacent purple wires run to small boxes fitted next to tanks 1 and 2. 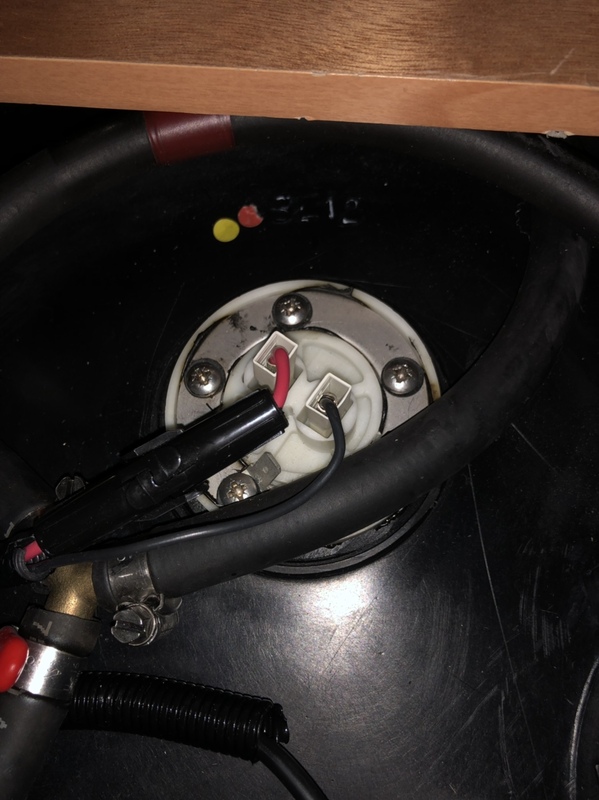 The small boxes connect to the screws on the side of each tank (also option for a top fitted unit with several stainless rods of varying length). These interface boxes feed back a voltage which isn't a smooth analogue signal, but jumps a level as each sensor is covered. Picture 2 matches the schematic. 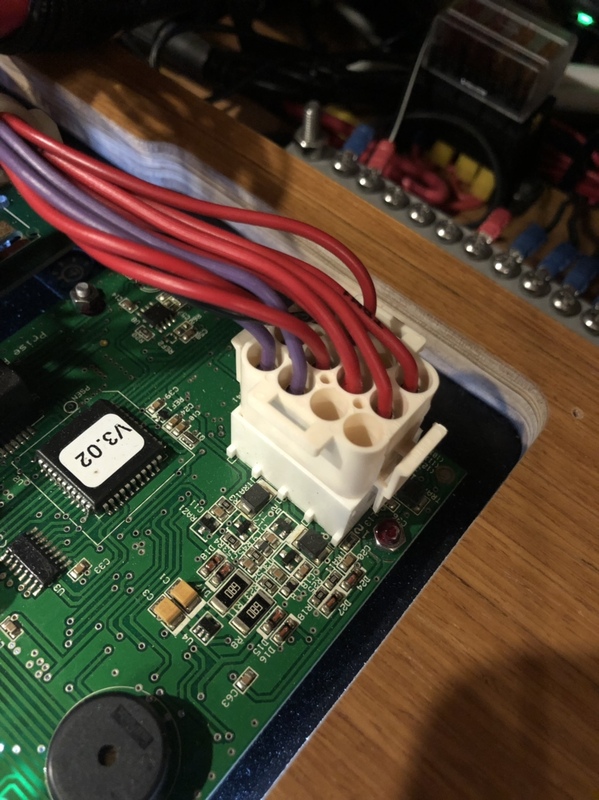 No problem regarding room to connect levels for tanks 3 and 4, just a matter of fitting pins in the two empty slots for wires to two extra interface boxes (which you'd need to buy, though it should be simple to make them yourself). The row furthest away on picture one shows the red wire which leads from 10 to the engine battery and the hole next to it is the unused no. 7. The extra fuel tank wire is only thing which doesn't match. I'll have a look around to see if I took pictures of my connector. The fuel sensor only needs one wire to that connector as the other is just a common -ve. I wonder if a second fuel tank was common option on your boat. It would make sense for Jeanneau to include the wiring in the standard loom. I don't think it a second tank was an option on the 42DS. It’s the cable into number 5 for fuel tank 2 that’s confusing me, I’ve only got the one fuel tank. Sorry, I posted accidentally before adding the last paragraph. I had some problems with connection dropping and was editing a local text file to minimise the risk of losing anything. I was still altering earlier test and didn't scroll down to the last paragraph when doing a copy & paste. Pretty certain that wire will run some where but not be connected at the other end, so no need to worry about it. I wonder if a second tank was an option, that would explain it. Can’t think where it would’ve gone but I’m getting in to tracing and labelling anyway so hopefully find out where it leads to. Installing the TLM-100’s this evening. Anyone know where we can find out what cable corresponds to what switch? I find the wiring diagram is the best information to solve that problem. It has each connector block detailed, and colour code keys for the wiring, and also approximate cable run locations. I will admit that the strict code presentation is a bit daunting, even quite hard to follow, but some “quality time” staring at the schematics eventually pays off. And despite the occassional variation, they seem mostly quite accurate. I like your idea of a labelling machine. Without the schematic, I suggest it is pretty hard to trace paths on that circuit board. 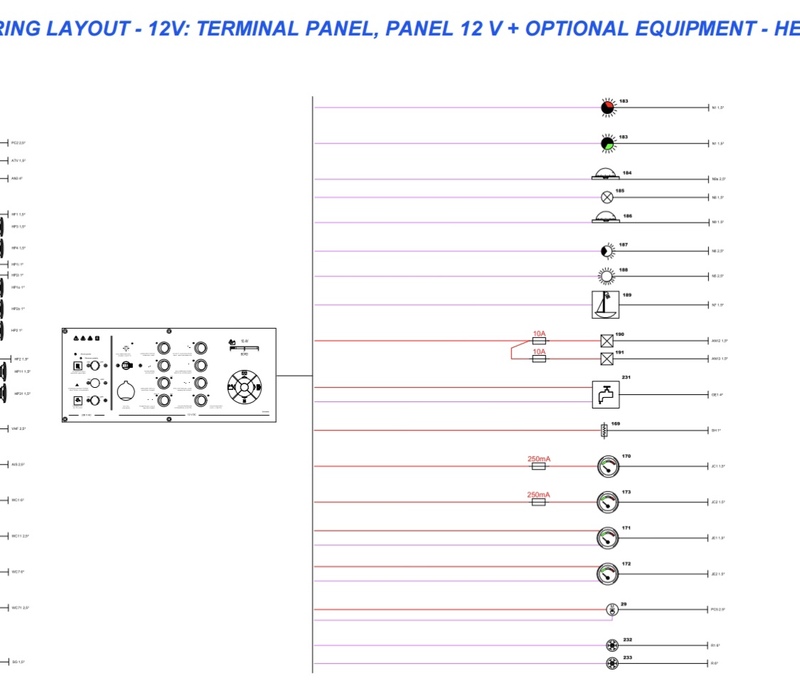 Unfortunately the wiring diagram I have only shows all the wires going in to the panel, no indication of plugs. And with the wires being the same colours it’s not helping. I think I’ll make a small jumper cable and then unplug the connection and then jump each one individually to work them out. Try to get the proper manual. It will be hard work as there's a lot of detail going right down to the colour and thickness of each wire. I only have one for the 42DS and uploaded it to give you an idea if it is the type of thing you are looking for (see link at bottom of this post). I looked at notes I'd made for my panel and they mention the following pages. You will see that it is likely to take a fair bit of effort to track things down. Let me know if you would like to look at the manual. I'd hope Jeanneau are consistent when making up wiring, there's a good chance my manual's diagrams (wire colours, connectors etc.) would match your boat for similar standard equipment. You can find a copy on my webstite. Unfortunately this is as close as I get with my wiring diagram. Nothing showing the back of the panel.